Finding a wall colour that you like is easy. Finding a nice colour and undertones for the wood floors that you want is also easy. However, choosing the right wall colourthat will match with a particular wood floor can bea challenging and complicated task. If you are facing this dilemma, here are some colour matching tips to keep in mind. Following a neutral colour palette is the easiest and most foolproof way to make sure that your wall colour matches your wood floor. Regardless of wood colour, finish, and undertone (grey, orange, or yellow undertones), a neutral-coloured wall will always look great. With a neutral wall colour, you can be flexible with your wood floor hue. You can use a combination of wood floor types and designs without worrying about the cohesiveness of the overall look. Moreover, neutral walls enable you to be creative when it comes to other room accessories — curtains, furniture, rugs, and others. A neutral scheme for your floors and walls will make it easier for you to incorporate other colours for your furniture and other room accents. Neutral wall colours include white, beige, grey, tan, cream, ivory, and taupe. White is the best choice to make room accents — including wood floors — stand out. You can opt for subtler whites, such as cream, ivory, or pearl shades if you find white too “striking” for your taste. Shades of tan, taupe, beige, and grey will give a touch of colour to the walls without being too bold or overwhelming. 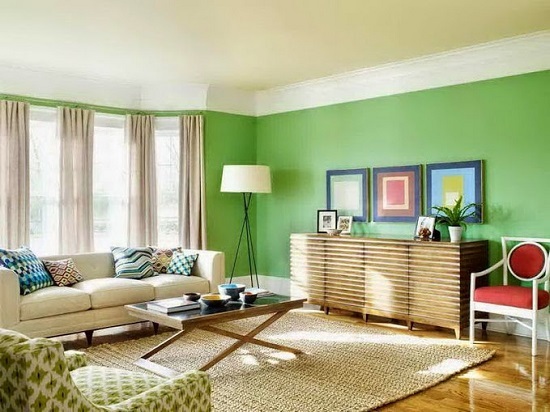 If you find neutral colours to be bland and boring, you can try an analogous shade for your walls. They’ll give a splash of colour to your walls without making the overall look too bold. Choose colours that have same undertones as your wood floor. For wood floors with orange, reddish, or golden undertones, warm colours will be a great choice for your walls. These warm-toned colours include yellow, terracotta orange, burgundy, and red. Consequently, cool-toned wall colours(such as blue and green) will complement wood floors with grey undertones. Bold colours in walls and floors give drama and personality to any room. If you love loud and bold colours, you can get the right match by understanding colour contrasts. Choose a wall colour that complements the shade of your wood floors, or vice versa. You can use a colourwheel for reference. Complementary colours are located opposite or across each other on the wheel. To simplify: If you choose to go with contrasting colours, you will go against the rules of analogous shade matching. Therefore, if your wood floor’s undertone is a warm colour, go for a cool-toned wall colour. Otherwise, choose a warm wall colourto go with a cool-coloured wood floor. Combining warm and cool tones together will make both colours stand out. For example, wood flooring with orange and golden undertones will look great with blue, grey, lilac, or green walls. If you have ashy wood floors, gold or peach would look nice on your floors.